There are three major trends in the health of both children and adults that have public health workers concerned: an increase in obesity, attention deficit disorder (ADD) and the amount of time spent watching television. Several recently published research studies indicate that television may be the culprit that leads to both of the others. Watching television leads to obesity in two ways. First, every hour that you spend sitting in front of the television, is an hour spent being inactive. Kids should be outside running around, riding bikes and playing with their friends. Adults ought to be involved in hobbies and community activities. Sitting in front of the tube results in burning fewer calories and a reduction in overall metabolism. Also, a number of studies have shown that people who watch television just eat more food. 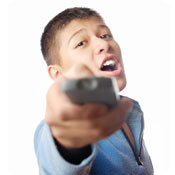 Watching television also has detrimental effects on the brain's cognitive function, especially in kids. Studies published by the American Academy of Pediatrics have shown that children who watch more than two hours of television per day struggle more with aggressive behavioral problems, difficulty in concentrating, sleep disturbances and a dramatically increased risk of alcohol consumption as teenagers. Although most studies have been conducted on children, other studies have shown that the results are just as valid for adolescents and adults as well. These negative effects can be explained by understanding the effect television has on the brain. Broadcast television in the United States has a particular frequency of flicker that cannot be seen, but which has an effect on brain function. A number of studies measured brain wave activity in people while they watch television. During these studies it was noticed that the brain waves in people watching television were similar to people who were in a trance. This trance-like state is associated with a decrease in the function of the cerebral cortex - the critical thinking part of the brain. When people are in this trance-like state for several hours per day, it becomes more difficult to focus their attention and control their impulses. The American Academy of Pediatrics recommends that children watch no more than two hours of television per day, and it would be better to reduce this even further. Many health experts are now encouraging parents to completely eliminate watching television for children under the age of seven, by which time their brains have the chance to develop a bit more.